Supply chain monitor Economic Daily News reported on Tuesday that manufacturer Inventec would see quarterly profits jump in the quarter starting in January 2017 because of a shifted launch date. At the same time, the publication said that the fourth quarter 2016 profits would not be changed from the third quarter. When asked about the report, Apple told AppleInsider that it doesn't comment on "rumors or speculation." However, sources familiar with the company's plans indicated that internally, there is no official delay until January for shipment of the wireless earbuds. One person briefed on the matter said plainly that there was "no way that these are getting pushed to January." In addition, contacts at Apple retail noted that AirPods demonstration units are already available in some stores. Out of 10 stores polled by AppleInsider, six of them had demo units. Where demo units are available, staff have already received training on the product. At those locations, employees are just awaiting notification from management to start showing the AirPods to shoppers. "We're ready to go any time," one retail source said. "We've got a few pairs for customer demonstration that we're just waiting on the word to start with." Several venues have also received hardware for review. Those arrived prior to the quiet reveal that the AirPods wouldn't ship in time to meet an original "late October" ship date. 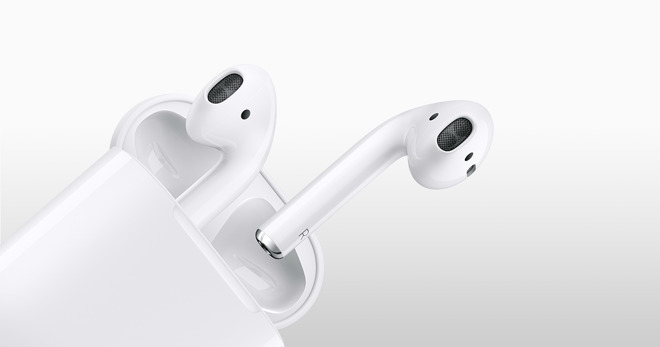 Stay tuned to AppleInsider's Accessories Price Guide over the next few weeks for the latest prices and availability on Apple's new AirPods.